Fame & Fortune: assorted dungeon ziggurats. Sometimes, the architecture is a little extraordinary. Altar to eldritch primordial entity. Leave an offering (minimum 10gp x dungeon level) at the top and recite the prayer etched in hieroglyphs at the bottom tier for 7 rounds. Offering disappears in cascade of silvery flaming orbs. 10% chance per dungeon level of getting +1 bonus on next dice roll. Black ziggurat offers interdimensional transit to other black ziggurats. 10% chance per dungeon level the ziggurat is activated when ascended and transports you somewhere very different indeed. Elevator upon top tier that transports to megadungeon location with a 10% per dungeon level chance of working. Elevator ascends or descends depending on relative altitude to ziggurat. Jumping off early has a 50% chance of stranding you in the Nine Hells (DM's choice). Generative ziggurat augments summoned creatures. Activate by reciting chants on each tier as you ascend. Casting a summon spell from the top tier grants creatures summoned +4 to Strength and Constitution for the spell duration. This must be repeated for each summon spell cast. Inductor of mystical energies. Any one charged magical item (casting a maximum of 3rd-level spells) left on the top tier of the ziggurat gains a charge per uninterrupted day left there. Once fully charged, the top tier glows with bronze faerie fire. Kennel for hounds of retribution. Recite the prayer on each tier then drop a scent-laden item down the grate on the top tier to unleash 1d6+1 hellhounds from lower tiers after the scented individual. Meditative center. By reciting the chants carved into the steps and meditating atop the ziggurat for 30 minutes, consciousness is expanded so a meditator can commune with infernal entities. Offertory to gods topped with blood-stained chains used to hold man-sized sacrifices. Hieroglyphs on steps bid a pleasant meal in the language of devils. Rostrum that amplifies spoken words of those at the top by a factor of two. A whisper can be heard as normal speech and speaking is equivalent to shouting. Actually shouting causes pain (-2 to hit and any Dexterity bonus) to anyone within 30' of the ziggurat. Sonic attacks upon those at the top cause +50% damage and impose a -1 penalty to saving throws. Tomb of abhuman dignitary. Hieroglyphs on steps detail mighty deeds, foes slain, royalty ravished and gods defied. 10% chance per level that tomb hasn't been looted; 1 in 6 chance of hideous curse befalling tomb robbers. Vestal flame atop hollow oil-filled ziggurat to purify sacrifices provides helpful illumination. Refilling this is done through a hidden port in the third tier. Oil refuelled every sunrise by three acolytes with ewers of consecrated lamp oil. 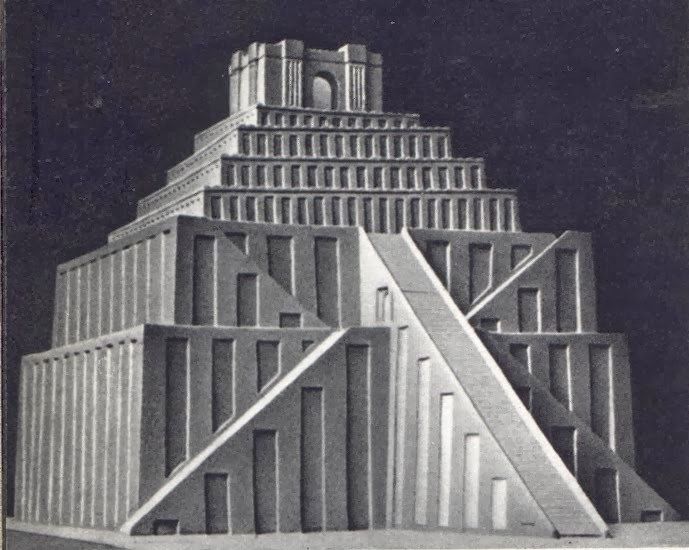 Ziggurat for ziggurat's sake. Pay no attention to the priest behind the curtain.